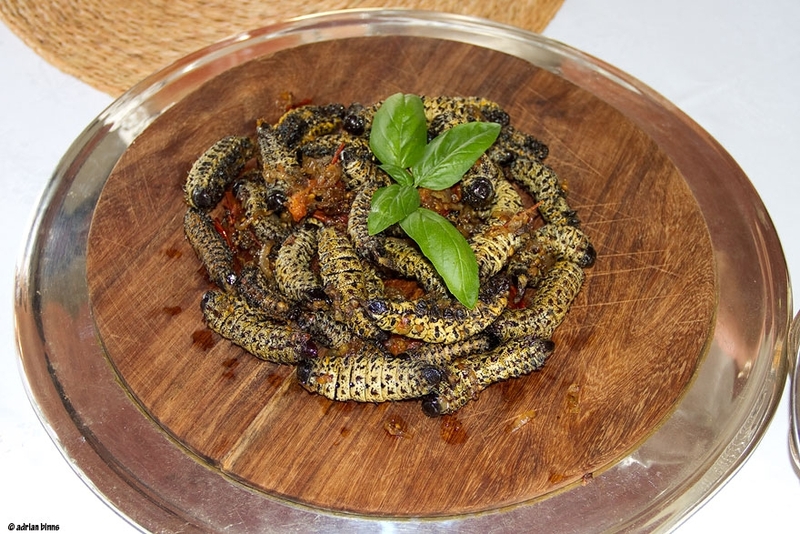 Cruncy, salty mopane worms are a favorite snack in Zimbabwe and other parts of southern Africa. The “worm” is actually a caterpillar of Gonimbrasia belina, commonly known as the Emperor moth. It is called a mopane (or mopani) worm from its diet — the leaves of the mopane tree. Ounce for ounce, mopane worms contain three times as much protein as beef. They have a whopping 31 mg of iron per 100 grams of dry weight, and are a good source of potassium, sodium, calcium, phosphorous, magnesium, zinc, manganese, copper and B vitamins. To harvest mopane worms, mature caterpillars are plucked by hand (or shaken from higher branches) and placed into buckets. Stubborn worms are pried loose with a stick. As they are handled, the worms excrete a brown liquid, which leaves the pickers’ hands slippery and wet. After the harvest, a picker pinches each caterpillar at its tail end to rupture its innards. The caterpillar is then squeezed like a tube of toothpaste to remove the slimy, green contents of its gut. Once cleaned, the worms are boiled in salted water and spread out on porches to dry in the sun. If industrially processed, they are canned, either dry or in brine. Dried mopane worms can be eaten out of hand. They reportedly taste much like salty potato chips, and have a satisfying crunch. Or, they can be reconstituted and cooked in a variety of ways — such as in a spicy or peanut butter sauce — and served with a maize porridge called nshima. 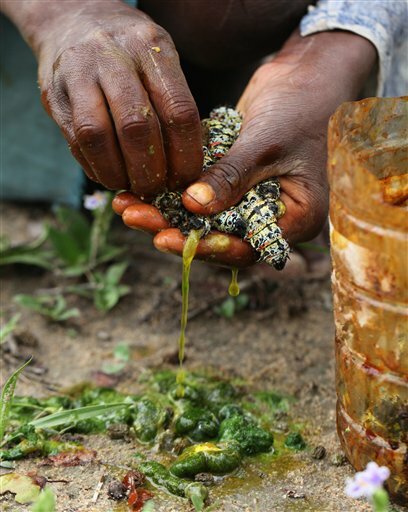 Unfortunately, climate change and over-harvesting have resulted in mopane worms disappearing from rural diets. You and I might not find eating a handful of insects an appetizing prospect. But for a region in which malnutrition isn’t just a word on a spelling test, the disappearance of this “golden” worm is bad news indeed. 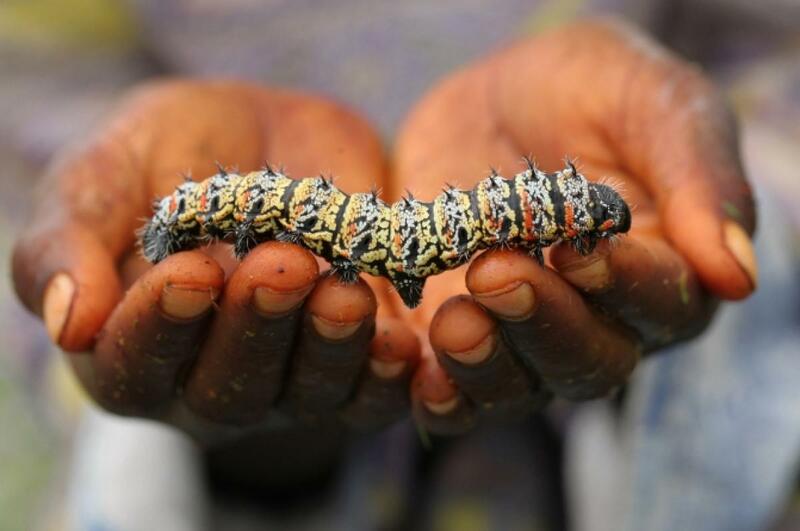 This entry was posted in Africa, animals, Botany, Food, Insects and tagged caterpillars, Emperor moth, Gonimbrasia belina, malnutrition, mopane worm, mopani worm, nshima, Zimbabwe by Jackie Fuchs. Bookmark the permalink.